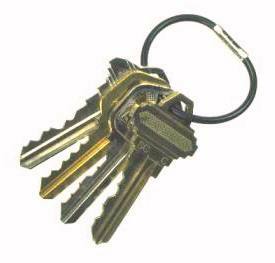 Know for sure that your keys have not been copied with our cost effective, easy to use, tamper-evident key rings. The tamper proof key rings are made of high strength nylon coated aircraft cable with nickel-plated brass end attachments. The cable itself is 3/32nd of an inch in diameter. The ends are 9/64th of an inch in diameter. Simply crimp the metal connector (crimping tool available, below, but any crimper will work) for permanent closure. Once locked, the tamper proof key ring must be destroyed to remove the keys. dark red, or royal blue. Buy 6 -19 25-packs $ 42.95 ea. Buy 20-39 25-packs $ 40.95 ea. If you need a REALLY large quantity, bulk quantities are available. Please call us at (877) 254-5411 for a quote. FREE OFFER: Buy 5 or more 25-packs and receive a FREE crimping tool ($13.95 value).